9/11 Tribute Lights from DUMBO (Down Under Manhattan Bridge Overpass) by Steven Archdeacon. 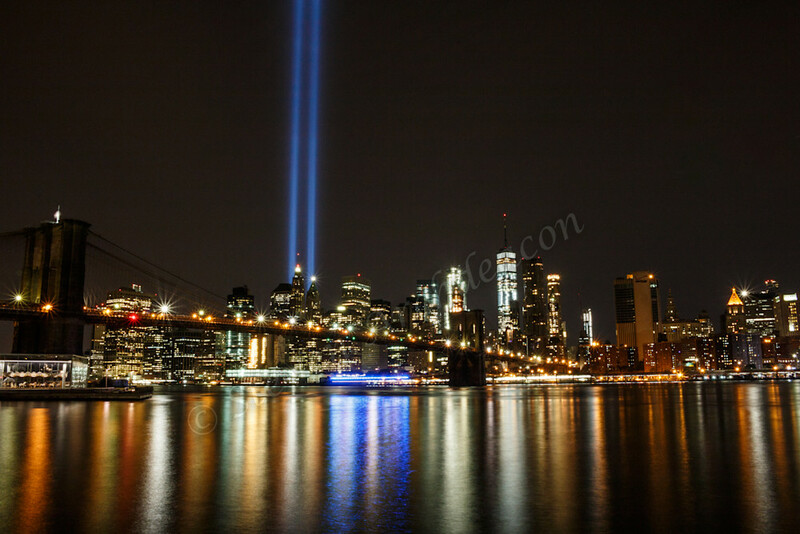 9/11 Tribute Lights from DUMBO (Down Under Manhattan Bridge). This picture was taken on the ground at DUMBO (Down Under Manhattan Bridge) around 2:30AM after the helicopter ride to get the aerial pictures. I love all the colors of the reflections in the water, especially the blue light in the water as it is from a boat with a blue light on it that started to move as I did a 25 second exposure. Definitely not something you're going to see very often that's for sure.